If you’re looking for shed that really stands out, this unique Dutch barn apex roof building is an exceptional choice. Built from Certified European softwood, the Shiplap tongue and groove clad walls offer exceptional protection against all-weathers. Another thing that sets this Dutch barn style shed apart is the fact it is fitted with three large windows. Butch barn style buildings typically feature a windowless design. The tall styrene glazed windows are situated next to one another and they filter a large level of light into the shed. A single door has been fitted onto the front of the building to maximise the amount of storage space offered. Secured with a good quality pad bolt, the door is lockable if you buy a padlock. For the price, a better quality felt would be appreciated, but you can pick up a better covering at an affordable cost if you shop around. A superior quality dip treatment has been provided to the shed prior to shipment. Whilst annual treatments are encouraged, the dip treatment means you won’t have to treat the shed straight after installation. 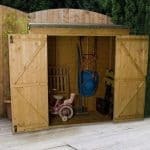 This is a great benefit for those looking to simply assemble and then use the shed straight away. You might also like to see the top 20 shiplap sheds currently on sale in the UK by visiting the WhatShed shiplap sheds awards league table. The interior uses a lesser quality OSB floor and roof. These can be strengthened in various ways, but it would have been good to see a sturdier construction that matches the superior quality of the exterior cladding. 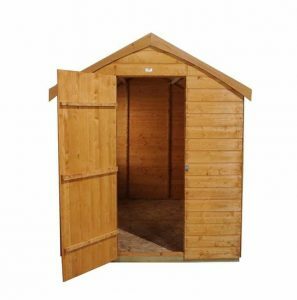 This unique storage shed from the Shed-Plus range is a very tall, spacious building. 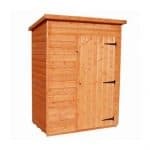 Though not initially designed with heavy storage in mind, with a few adjustments you could turn this shed into a workshop and make it more suitable for heavier weight items. 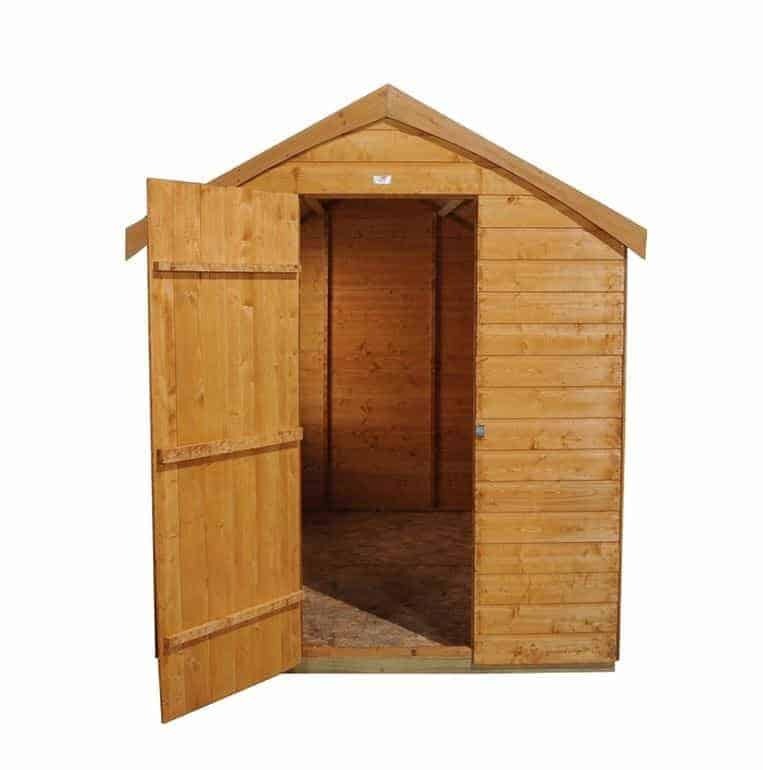 The depth and width of the shed is great; offering a huge amount of storage space. There’s also plenty of head height inside the building thanks to the apex roof design. One of the reasons this shed is so affordable is because it uses solid sheet materials for the roof and floor. It doesn’t really make too much difference to the roof as it seems to provide a pretty sturdy support. You can also add a couple of roof joists to make it more durable if you prefer. On the whole though you should find it can withstand anything the British weather throws at it. The apex roof is a fantastic weatherproof addition to the building, though in our opinion the felt used to cover it could be a lot thicker. It would be worth looking into buying a better quality felt if you want to maximise its longevity. With the floor, the solid sheet board won’t be a problem if you’re using it to store basic, light equipment. However, if you’d like to use it as a workshop or to store heavy boxes, lawnmowers and other tools, adding another sheet of thick wood is a good idea. The outside of the shed benefits from pretty high quality Shiplap tongue and groove. This is the highest quality cladding you can invest in and it does offer an incredible amount of benefits. For example, the Shiplap design of the cladding supplies a small channel located in the centre of each panel. This doesn’t just give the panels a distinctive look, it also helps to funnel rain down onto the ground, thus resulting in rot resistance. Tongue and groove also adds a few benefits of its own. As each panel forms a strong, wind-tight interlocking design, the shed benefits from a great deal of weather resistance. Unlike some other sheds in the collection, this one features standard 28mm x 28mm framing. This supplies adequate support and is the most common type of framing used by manufacturers. Shed Store have dip treated the shed to give it a layer of weather resistance. 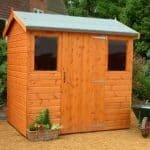 Whilst annual treatments are advised, you won’t need to add an extra layer of treatment right after assembly which is great for those looking for a shed they can use right away. With Dutch barn style sheds, they typically tend to come with double doors. This one however comes with a single door with fairly standard measurements. The manufacturer has chosen a single door to enhance the amount of interior space provided. It has a hinged, ledge design which makes it easier to install a hasp and staple if preferred. However, it does come with a pad bolt so a hasp and staple isn’t necessary. Three styrene windows are situated at the side of the building. They are fixed so you cannot open them. However, they do come with the advantage of being 100% totally shatterproof. So if you have pets or young children you won’t have to worry about risk of injury if the windows get broken. They also allow a lot of light to enter the shed. There are some security enhanced features we like and others we feel could be improved. The cladding is the first thing we love about this building. Shiplap is very difficult to break through and it gives the shed a more stable design. We also like that the styrene windows are fixed and typically stronger than glass. A thief won’t be able to climb through or break them very easily. However, the pad bolt on the door will not keep anybody out of the shed. For the cost, it would have been preferred to see the Shed Store include a padlock. They aren’t expensive to purchase which is why it is a little surprising one isn’t included. Obviously privacy is also going to be limited due to the three large windows. However, blinds or curtains could be placed behind them. There are no special customisation options with this shed. It comes with the same type of extras as many other models offered by the Shed Store. However, that isn’t to say that these extras aren’t worth buying. There are three extras in particular that we recommend. The first is the wooden DIY base kit. It comes flat packed and is designed to provide a secure and steady base for gardens that don’t have a concrete base available. 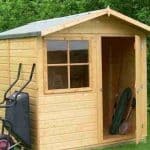 If you were to build the shed on top of a lawn, not only would it potentially suffer from stability issues due to uneven ground, but it would also expose the floor to moisture, leading to rot and other damage. This base has been treated and comes with a 15 year guarantee. It can be used as soon as it has been erected which is different to a lot of other bases. The kit includes base spikes which help to really anchor the base into the ground. Treatments are another important extra. As mentioned, the shed does need to be treated annually. So it would save time buying one of the two treatments offered by the Shed Store. Choose from dark brown or harvest gold. Both offer a superb colourful finish that will really enhance the look of the shed. It’s nice to see a pad bolt added to the door, but without a padlock it won’t fully secure the shed. Shed Store give you two choices of padlock. The Yale security kit may be better suited to some buildings, but as this model comes with a pad bolt, it really isn’t needed. The only extra thing it includes compared to the single alarm padlock offered is a hasp and staple. So you can save a little money and buy the single alarm padlock instead. Sold with 3 keys and a high pitched alarm, this is an excellent thief deterrent. A solar light is available which on larger buildings could come in very useful. However, we really don’t feel it is necessary for this shed. We would have loved to have given this a 10/10 rating but the interior prevents us from doing so. Though the solid sheet boards used for the roof and floor do keep the costs down, they can’t really be classed as high quality materials. Overall the 10 year anti rot guarantee does give you peace of mind that this shed will last. However, the solid sheet floor will only last for many years if you stick to storing lightweight items. Anything heavy could lead to damage. 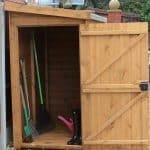 This shed is capable of storing a good range of tools and equipment. 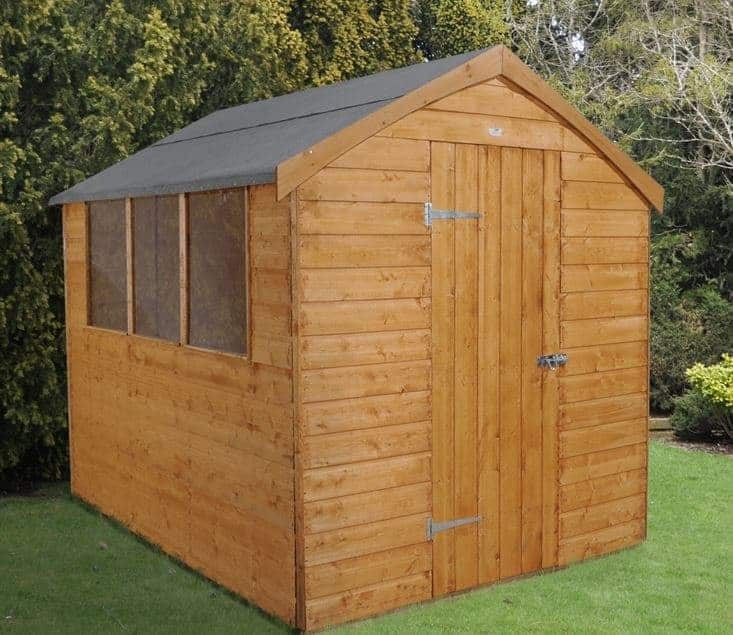 It’s a mid-size shed and should suit most people’s needs. Whilst full instructions are provided, there are a few things that you might struggle with when installing this shed. The roof is the main thing that’s likely to cause problems. However, on the whole it is pretty simple to assemble, you just need to set aside around 4-6 hours to build it. 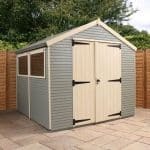 You do get a lot for your money with this shed and its unique and attractive design makes it worth the slightly higher cost that you pay compared to similar competitor sheds. Final Thoughts: Packed full of character, this shed combines the benefits of an apex roof with a Dutch barn style. It gets its design from the Dutch barn design bargeboards installed on the gables of the building. This isn’t its only appeal however. The shed also comes with 12mm Shiplap tongue and groove cladding, a 10 year anti-rot warranty and three tall, large styrene glazed windows. You won’t need to spend a lot of money upgrading the building either which is always a plus. A single hinged ledge style door provides spacious entry, whilst also maximising the amount of interior storage space.